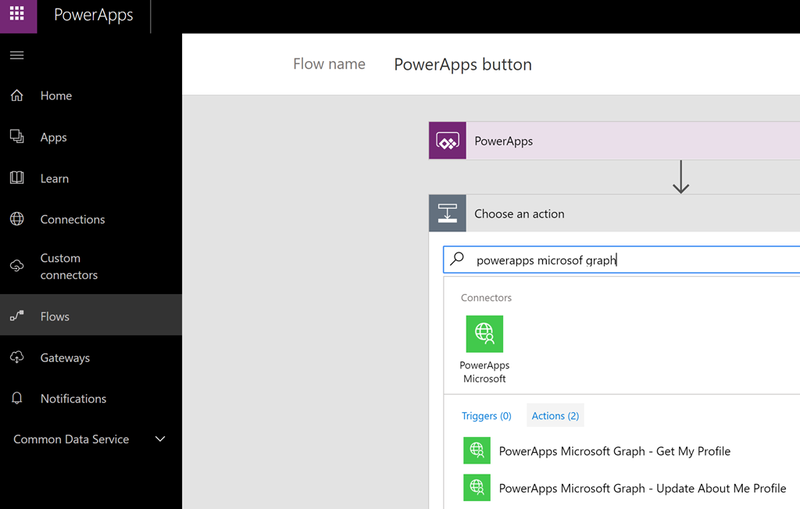 Microsoft PowerApps and Flows are great and simple to get started and use solutions for creating Apps and for how to “Code with No Code”. 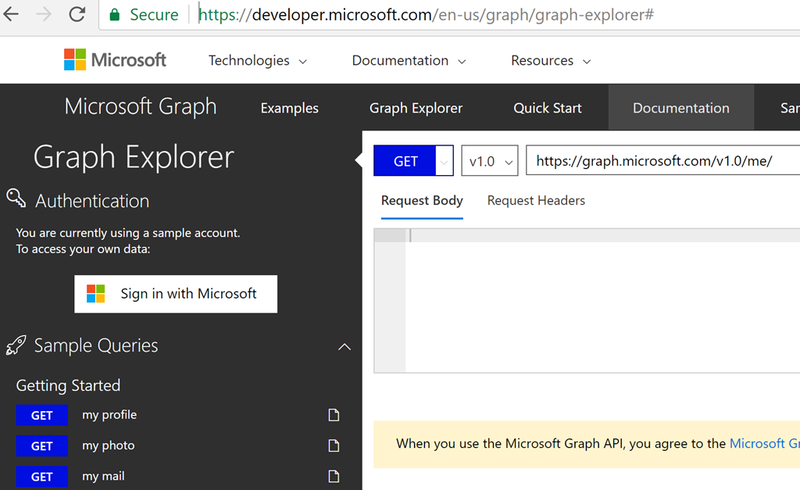 And the Microsoft Graph API is a great source of information for your Organizational data, including Users, Devices, Apps and Data. 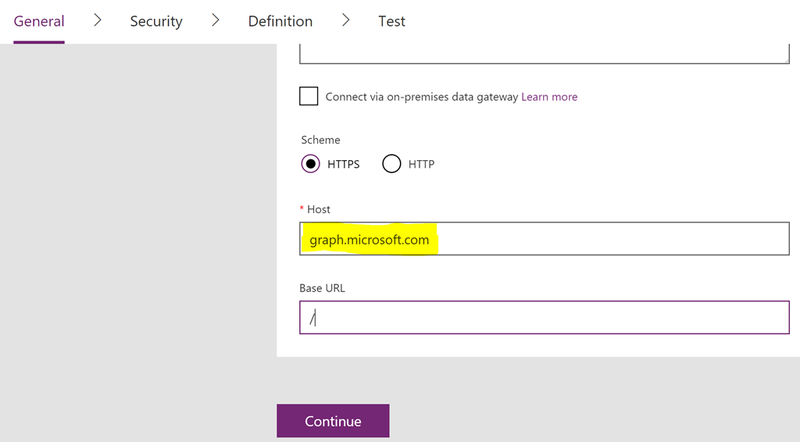 The Microsoft Graph has one common endpoint for which you can access and use all the information you want. 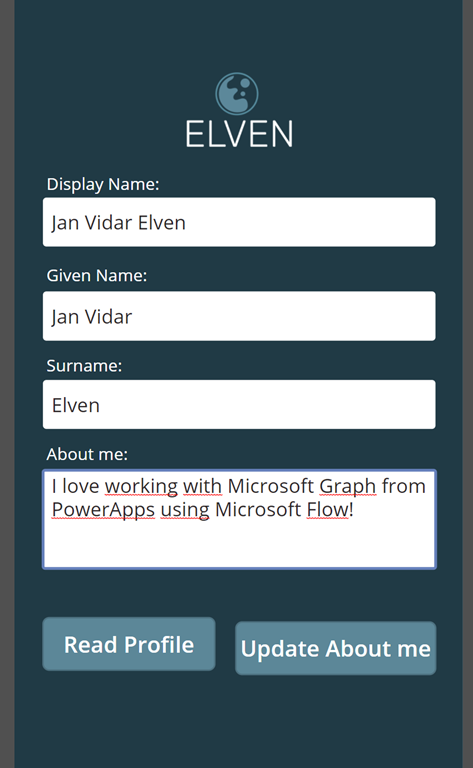 The purpose of this blog post is to show how to set up the requirements for accessing Microsoft Graph from PowerApps and Microsoft Flow. 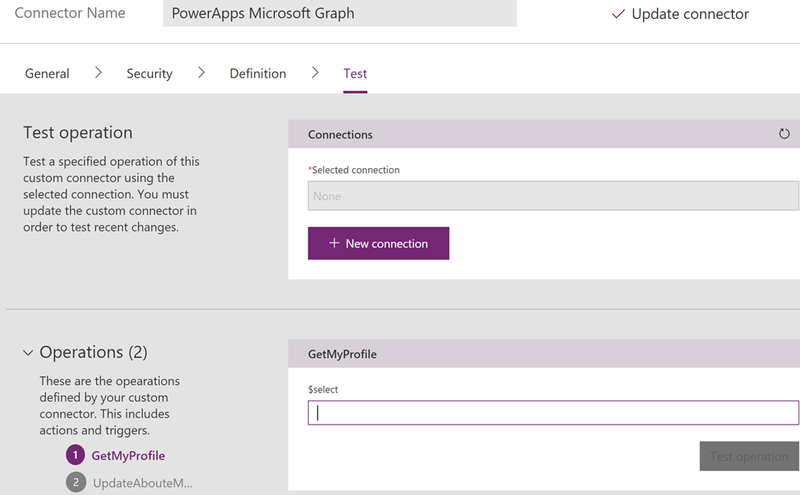 I will show how you create an App Registration in your Azure AD tenant with the required settings and permissions for Microsoft Graph, and how you set up a custom connector in PowerApps and how to connect to that using PowerApps and Flows. 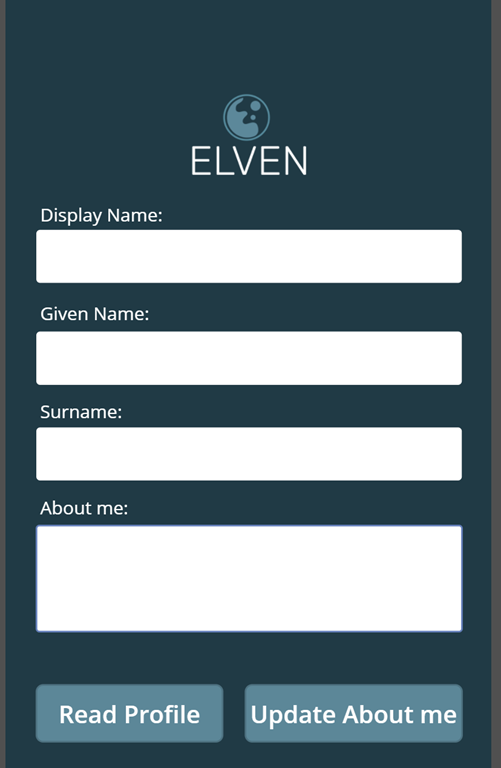 We will create a simple App and see how you can share that App in your Organization. Let’s get started! 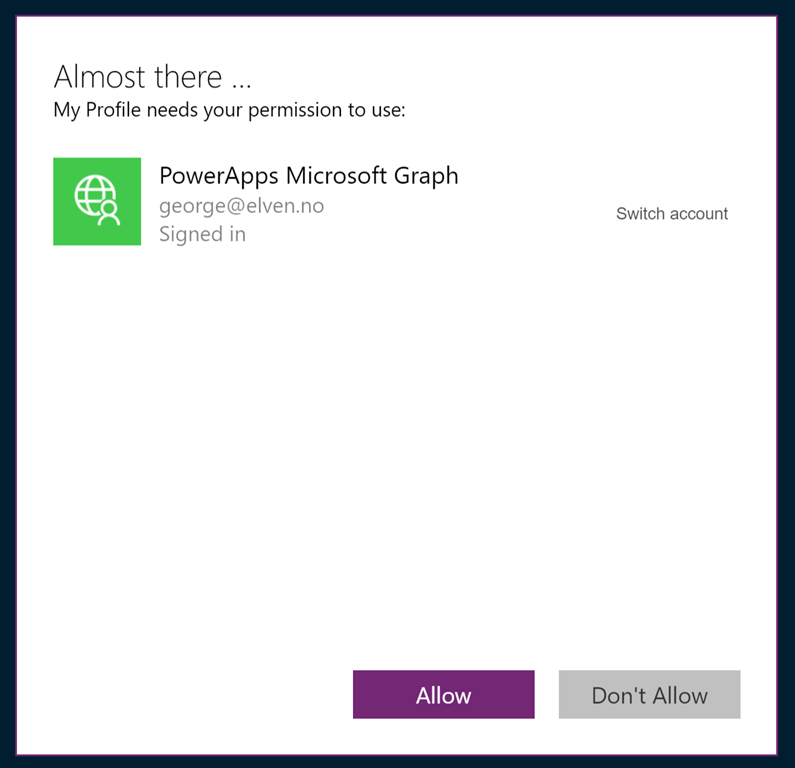 If you want to access the Microsoft Graph you will need an App Registration, for which you can authenticate against the Graph API. 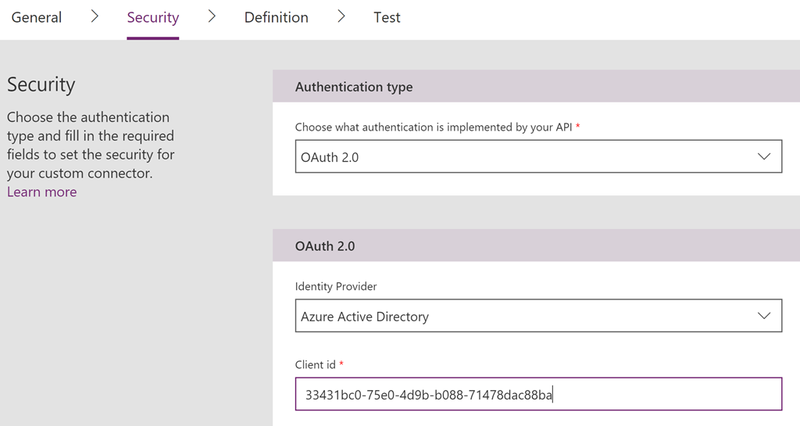 There are two options available, depending on whether you want to authenticate only with Azure AD Work or School accounts, or if you also want to authenticate with Microsoft Accounts. 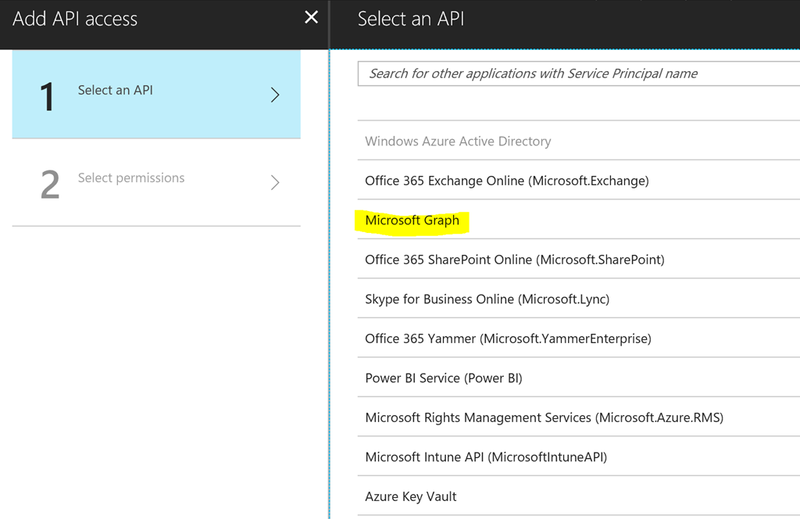 The first option is to use the Azure AD portal (https://aad.portal.azure.com), the second option is to use the Application Registration Portal (https://apps.dev.microsoft.com). 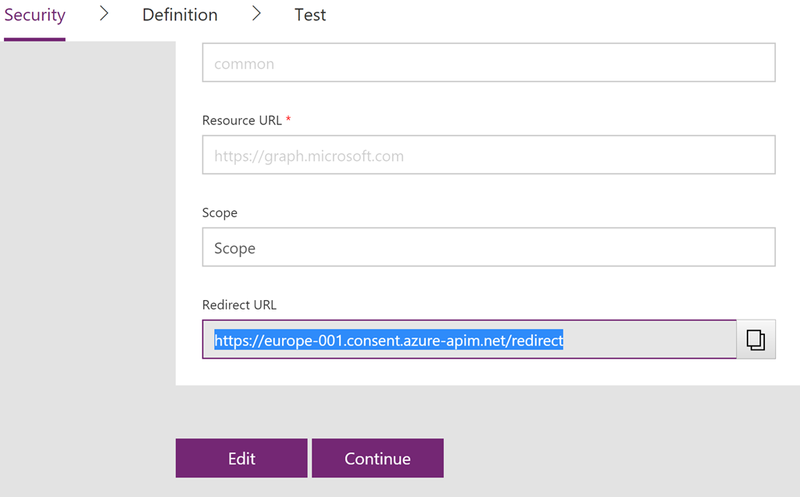 I will use the Azure AD Portal. 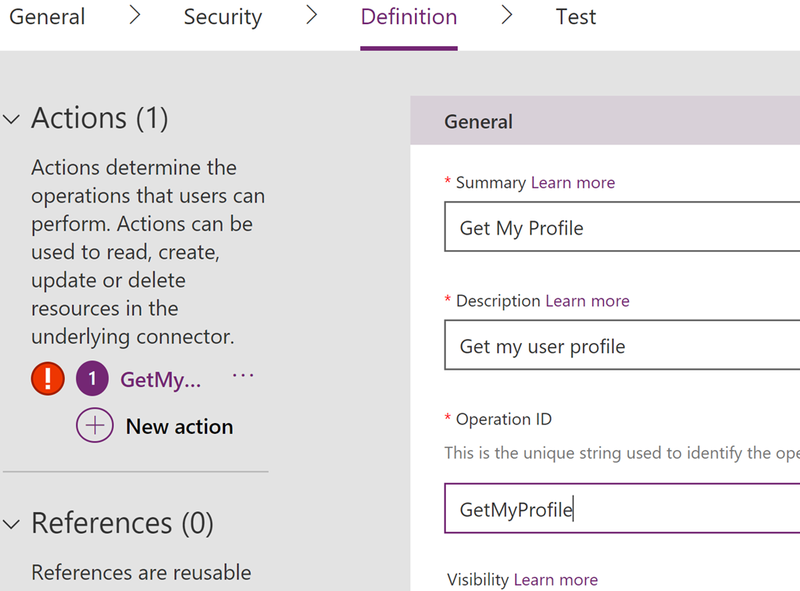 Next, under Settings, click Required Permissions. 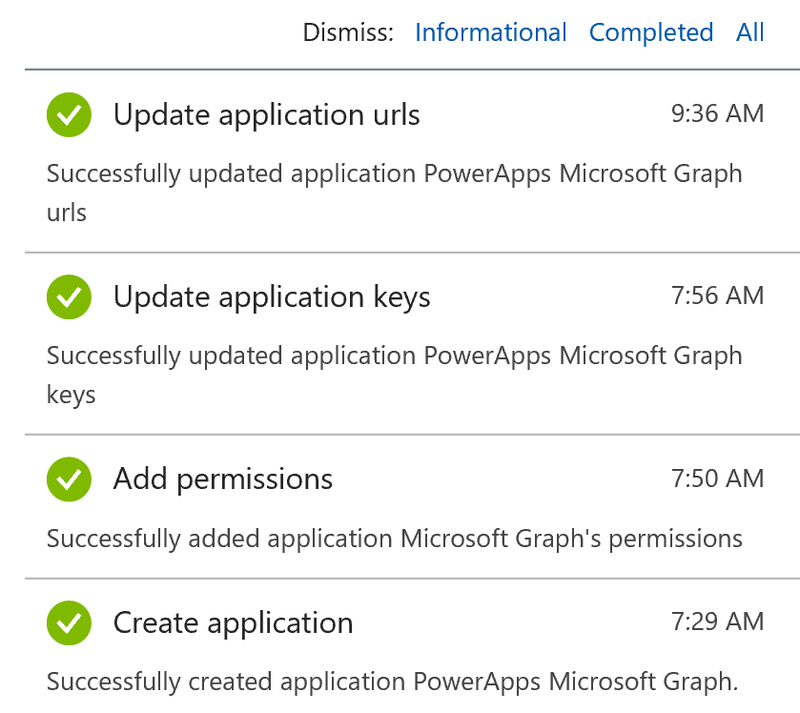 Here we will add the permissions we need for accessing the Microsoft Graph. Application Permissions. 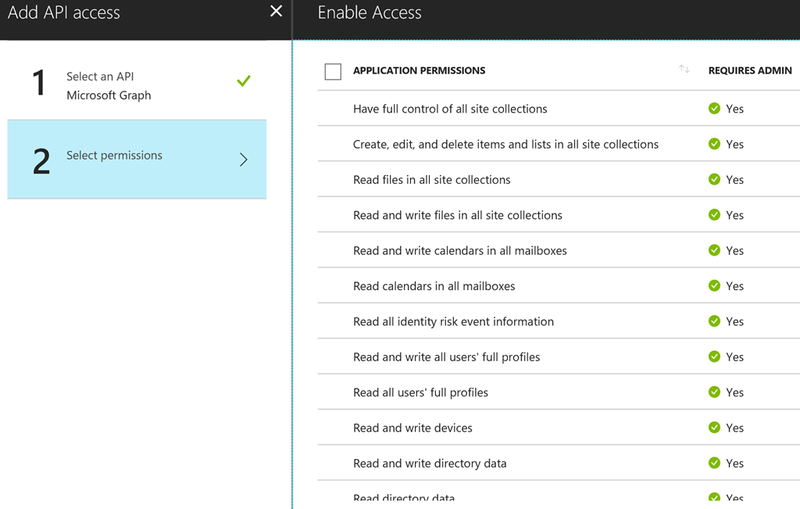 These permissions are for Apps that run without a user logged in, like a service or deamon. Delegated Permissions. These permissions are for running apps in the context of the logged on user. 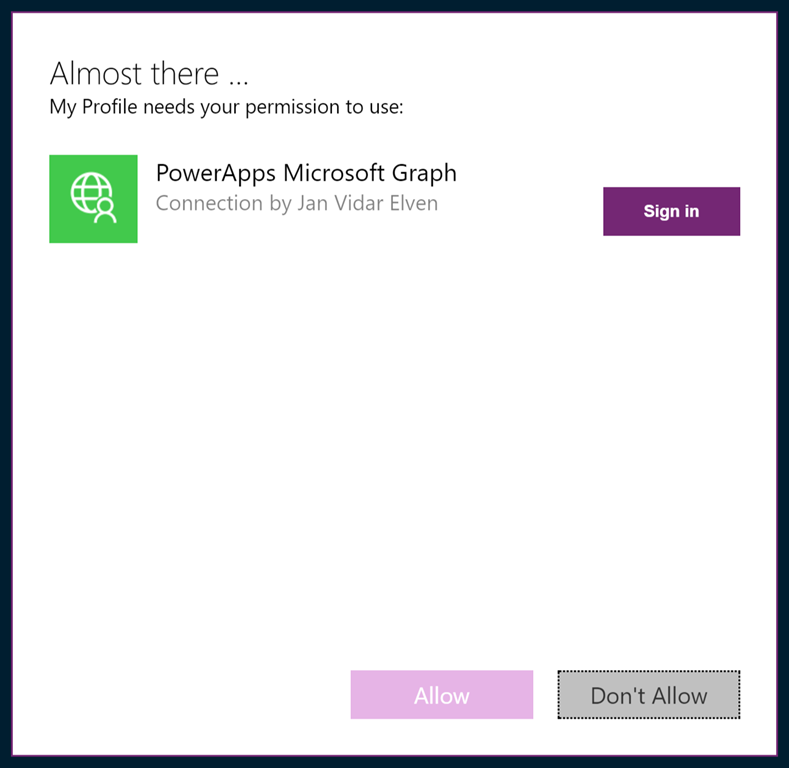 The users effective permission will be a least privilege of these permissions you give the App, and the users actual permission in your organization. Note that there is a column for Require Admin which either contains a Yes or No. If you select a permission that require Admin grant, the Global Administrator must click on the Grant Permissions. In our example now I don’t have to do this, but remember that any time you update the permissions for your app registration that require Admin, you must click on this Grant Permissions button. 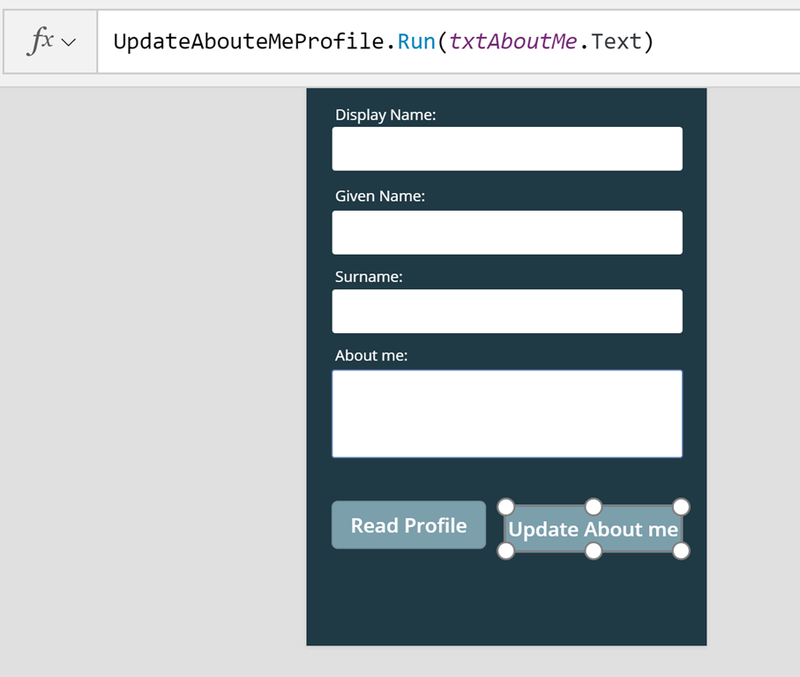 We are now ready to head over to PowerApps and create our Custom Connector that will use this App Registration. 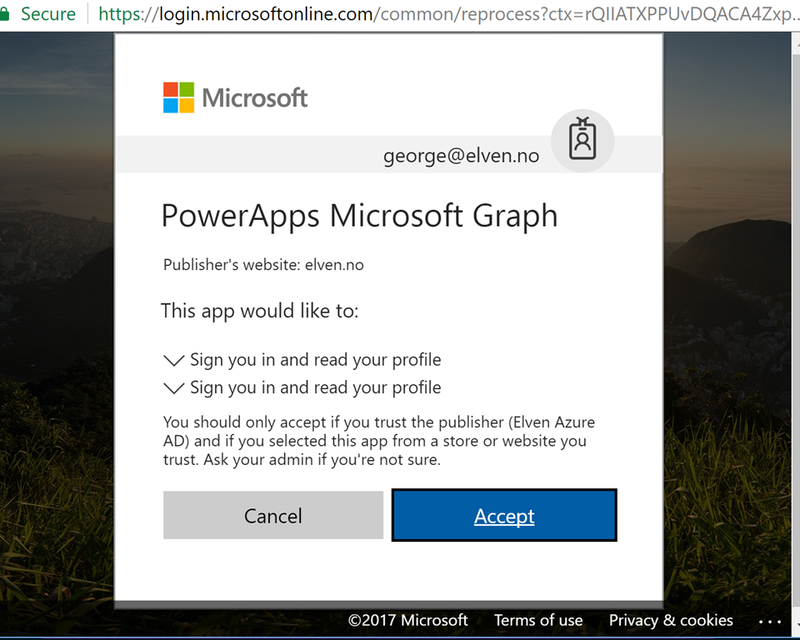 Go to https://web.powerapps.com and log on as your normal user account, you don’t have to be an admin to do this. 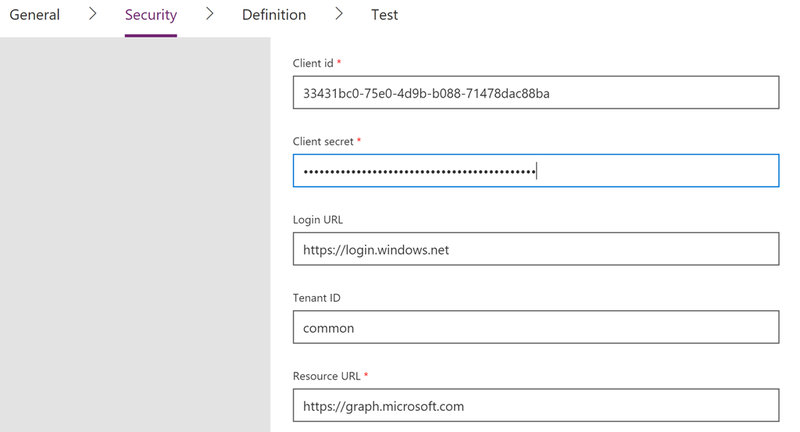 Under scheme select HTTPS, and under host, specify graph.microsoft.com. The base URL is “/”. Scroll further down. 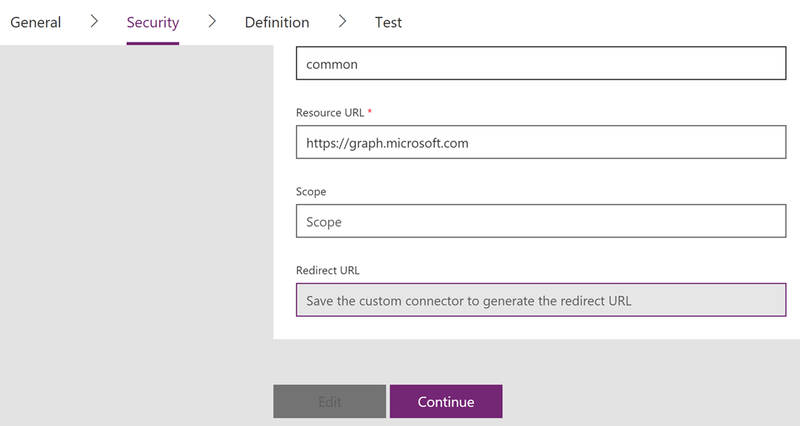 Scope is optional, and take a note of that Redirect URL will be generated after we save the connector. Save that and we are ready for the next step. 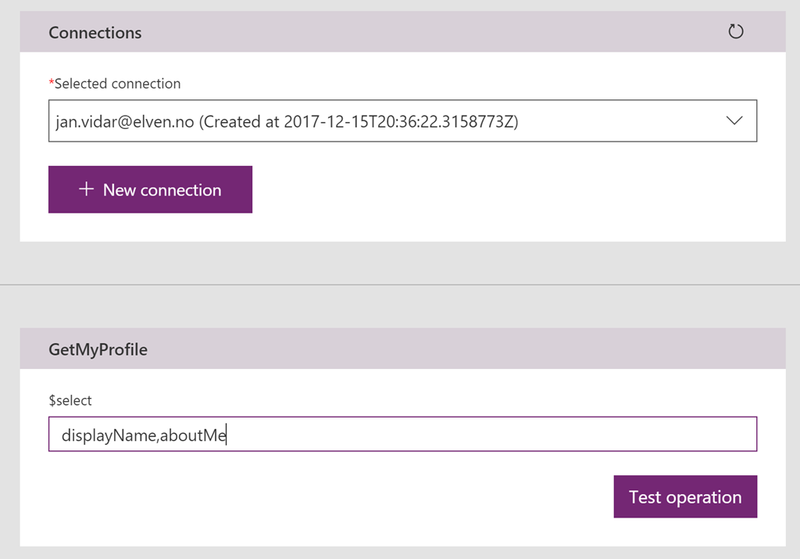 To summarize, we have now created an App Registration in Azure AD with these 4 steps, as well as prepared a Custom Connector i PowerApps. 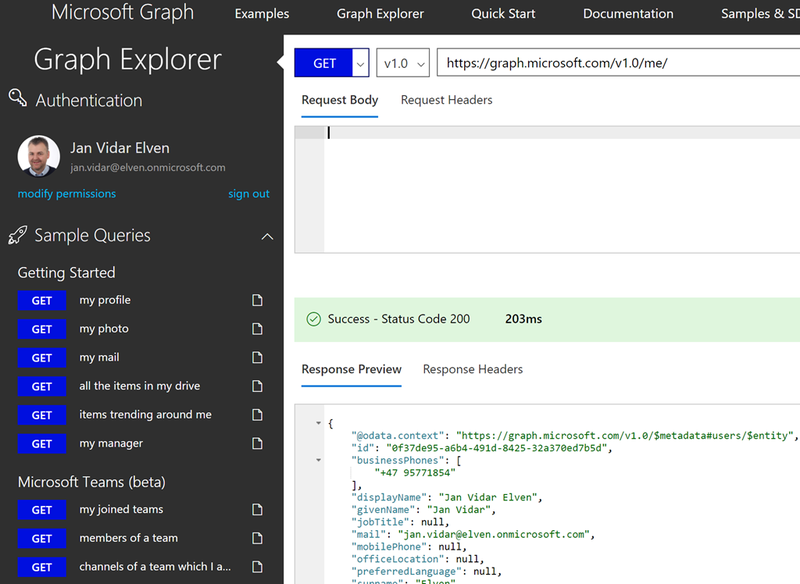 Now we need to prepare some queries we are going to run in Microsoft Graph. 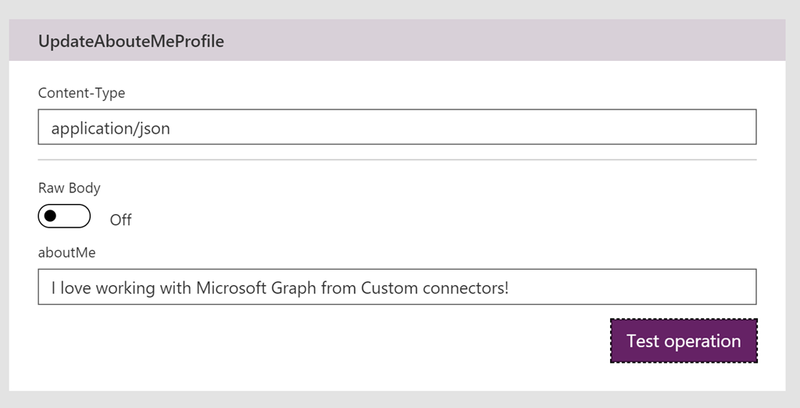 At the Graph Explorer page you can run from a great collection of samples, and you can either run with a sample account, or log in using your own Work/School or Microsoft account. 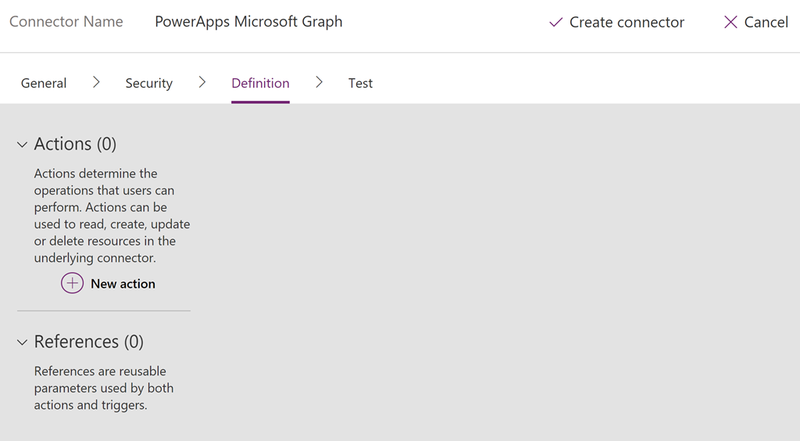 Now that we have seen how we can run queries for reading and writing to Microsoft Graph, lets try to implement that in a PowerApp, but first we need to create some Operations for our Custom Connector. Click on Update connector to save this operation. 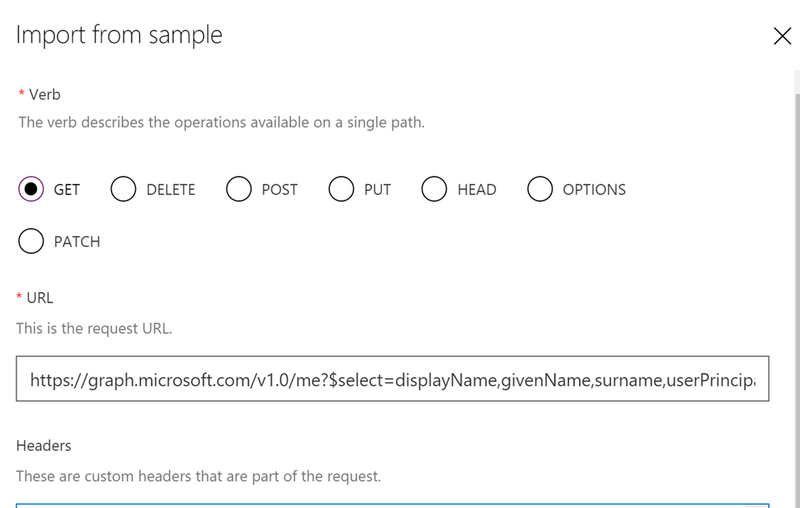 As this operation does not return a specific response object, I will let the default response be as it is, and will save my settings by Updating the connector. The response is also successful. 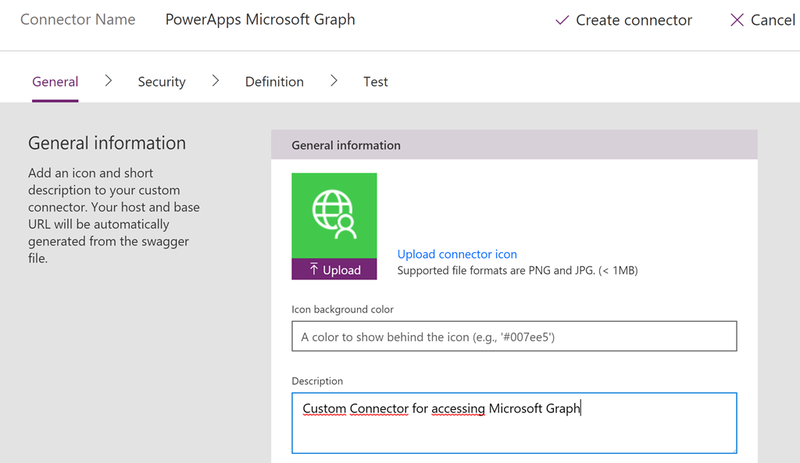 Now that the operations are tested and verified, we know that the Custom connector can successfully access the Microsoft Graph, and we are finally ready for creating a PowerApp and testing it all out! 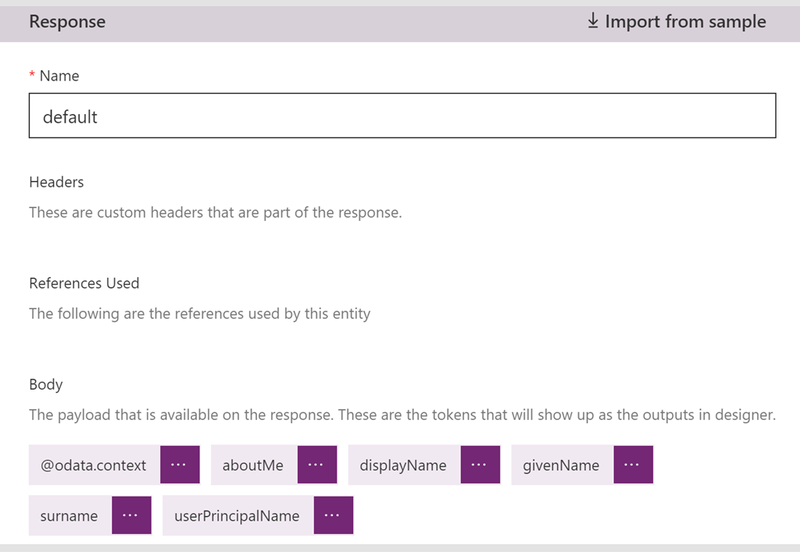 Now I can refer to this data source in my PowerApp, for example in my buttons. 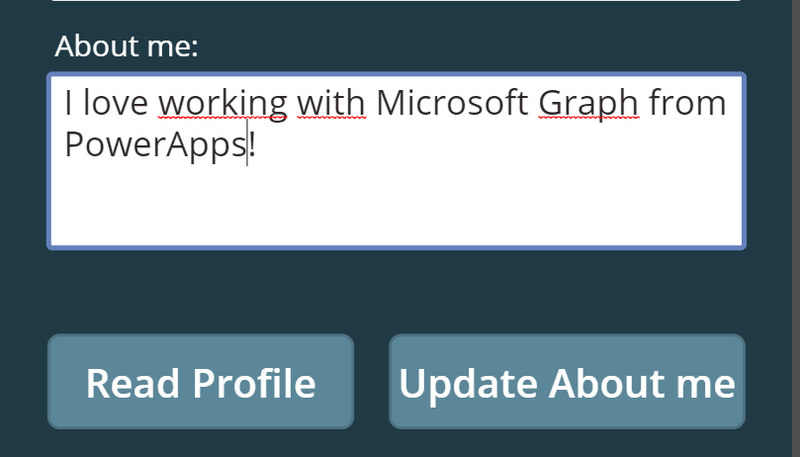 I will for the first button add an action for getting my profile data, and for the second button add an action for writing back to “about me” in my profile. UpdateContext is a function that would hold data into a variable i specify. 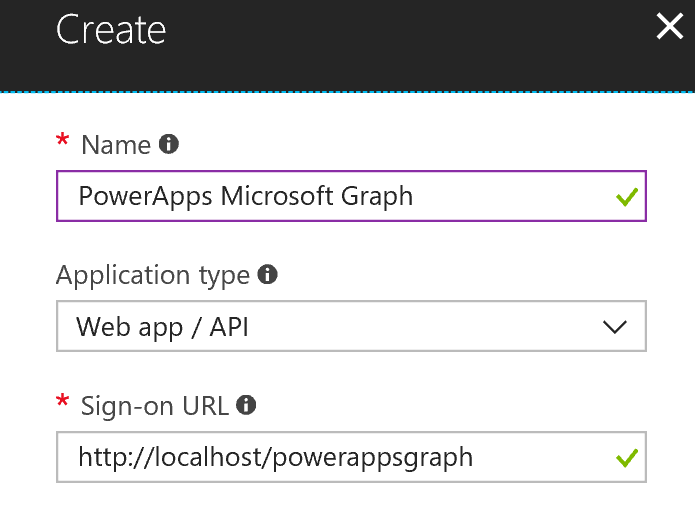 Calling the PowerAppsMicrosoftGraph.GetMyProfile operation would return a response I want to save to that variable. 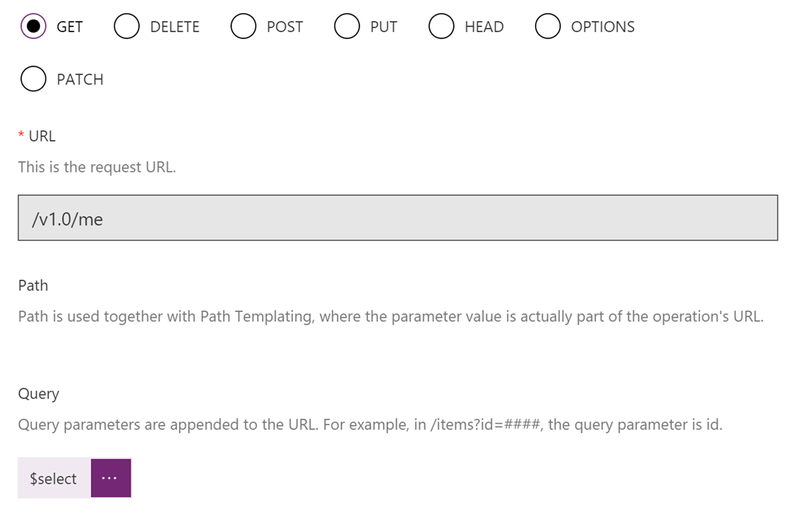 Using arguments for $select I can specify which attributes I want to return as a response. 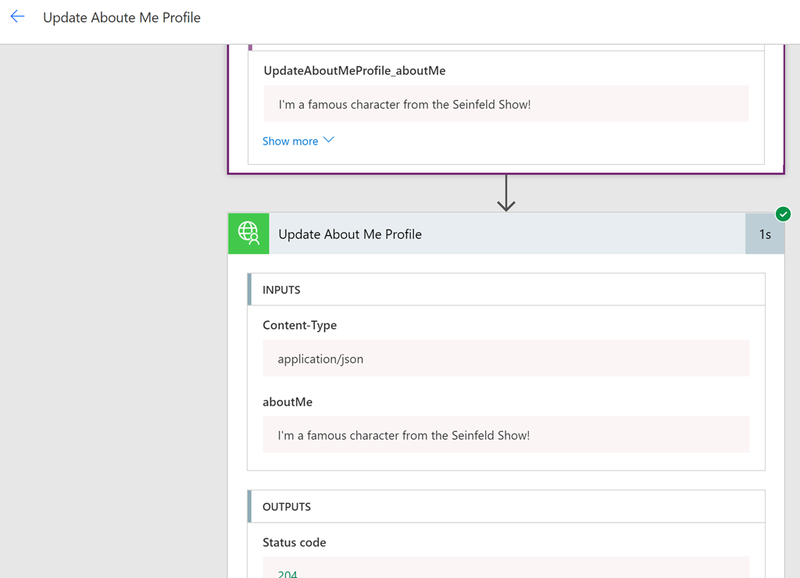 So by using UpdateContext and specifying that I save the response back to the MyProfile variable I can use that variable in other controls. 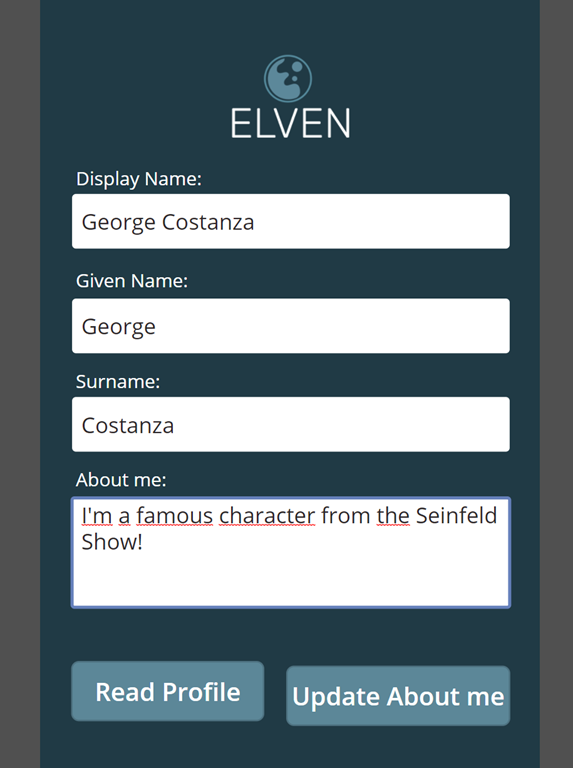 And l would do the same for the other text boxes, using MyProfile.givenName, MyProfile.surname and MyProfile.aboutMe. 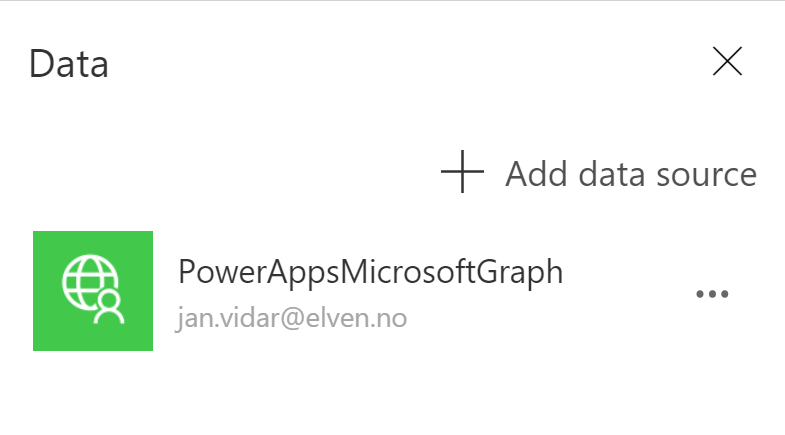 Now you can Save, give the PowerApp a Name and a chosen Icon, and then Publish the PowerApp. 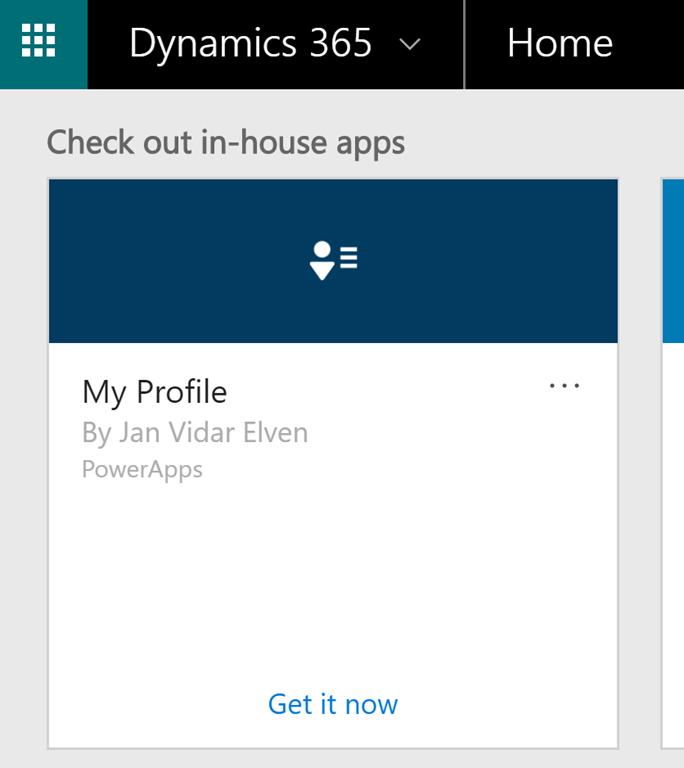 You are now ready to run the PowerApp! 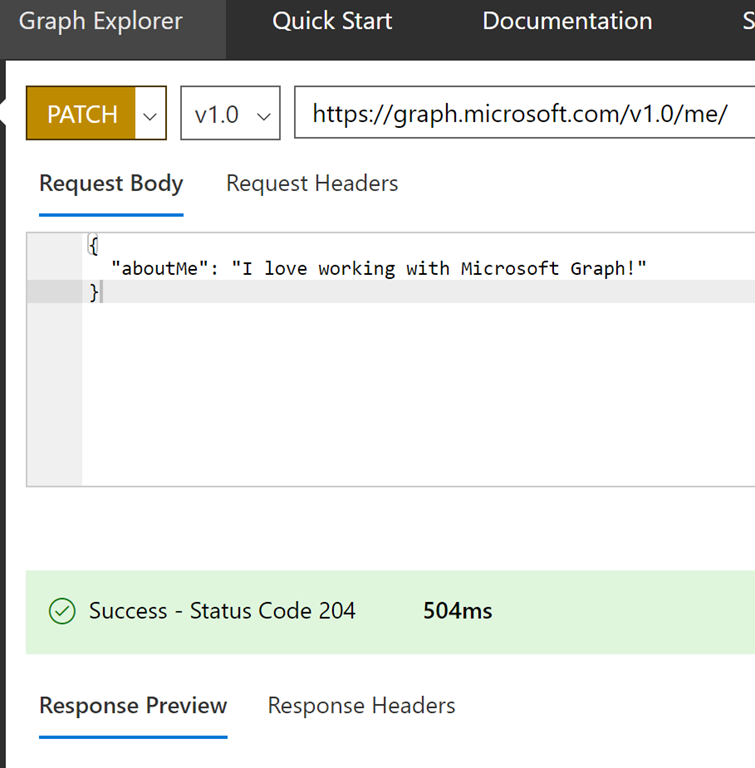 And then click on the butting Update About me, this will run the PATCH query against Microsoft Graph and update the “about me” attribute. 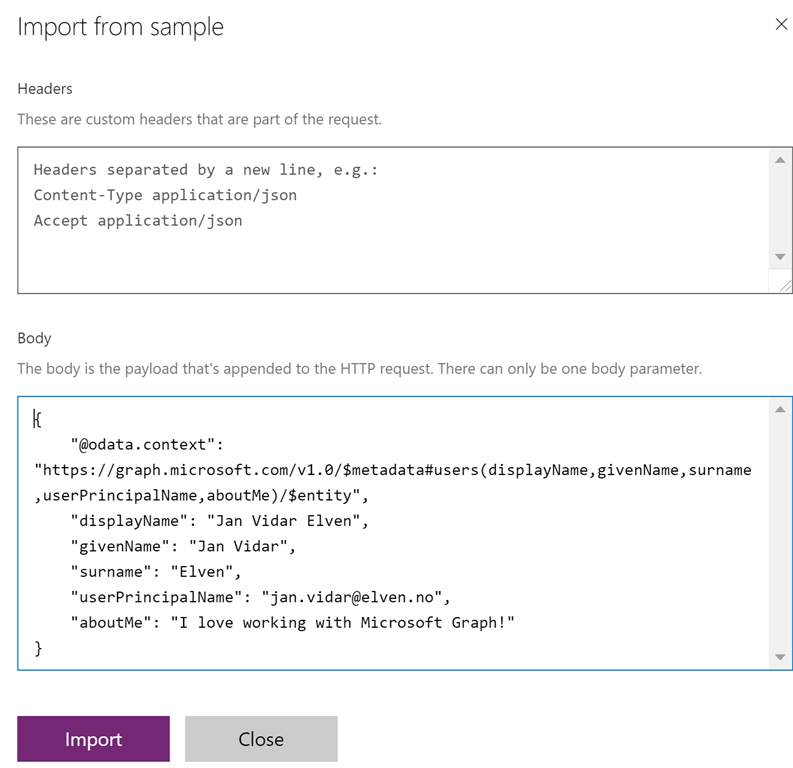 This is a flaw in PowerApps using Custom API connector, as it expext a JSON response object, but some operations against API’s are designed to return a 204 No Content response. We will fix that later by using a Flow. 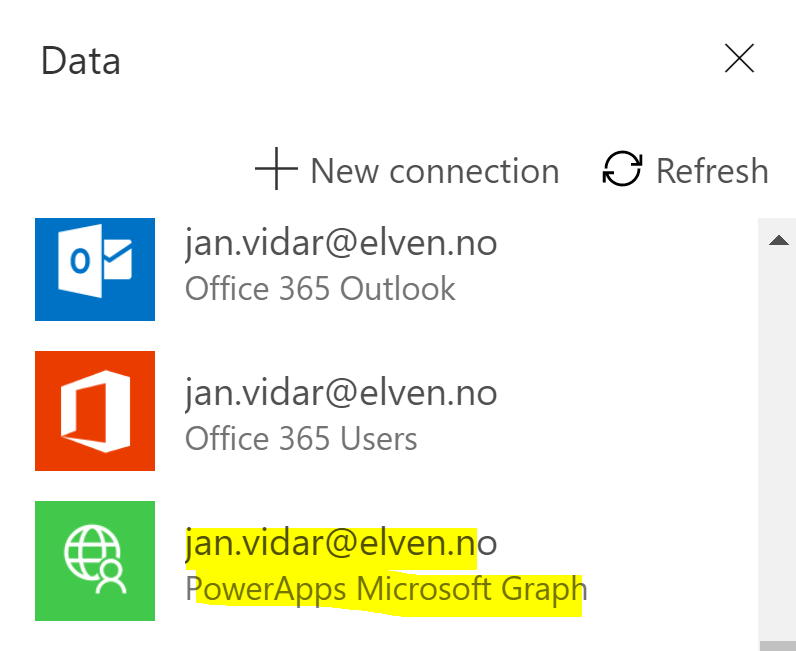 At this point we have seen that we can access the Microsoft Graph using a Custom connector from a PowerApp. 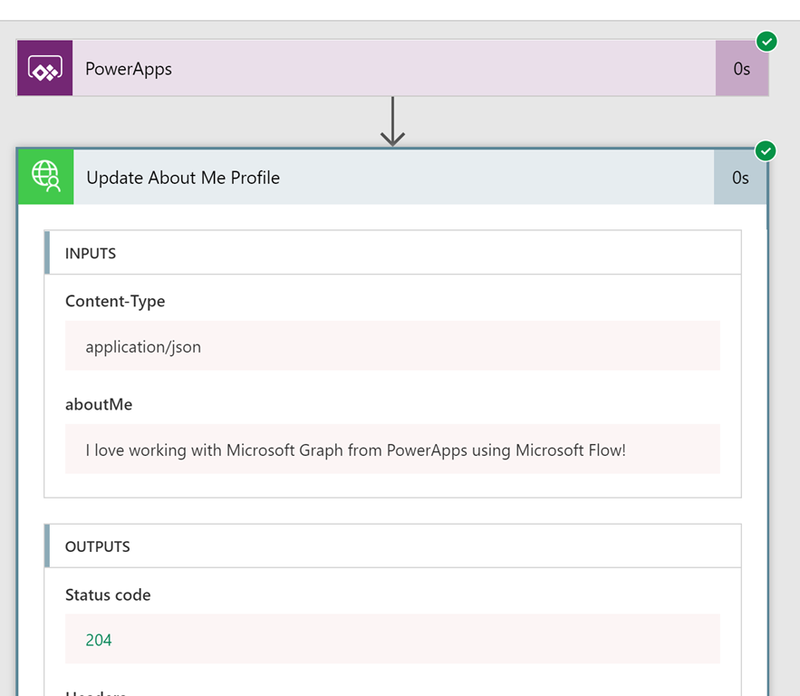 There are a couple of more scenarios I will show before I wrap up this blog post, using Flows and Sharing the PowerApp with other users in my organization. 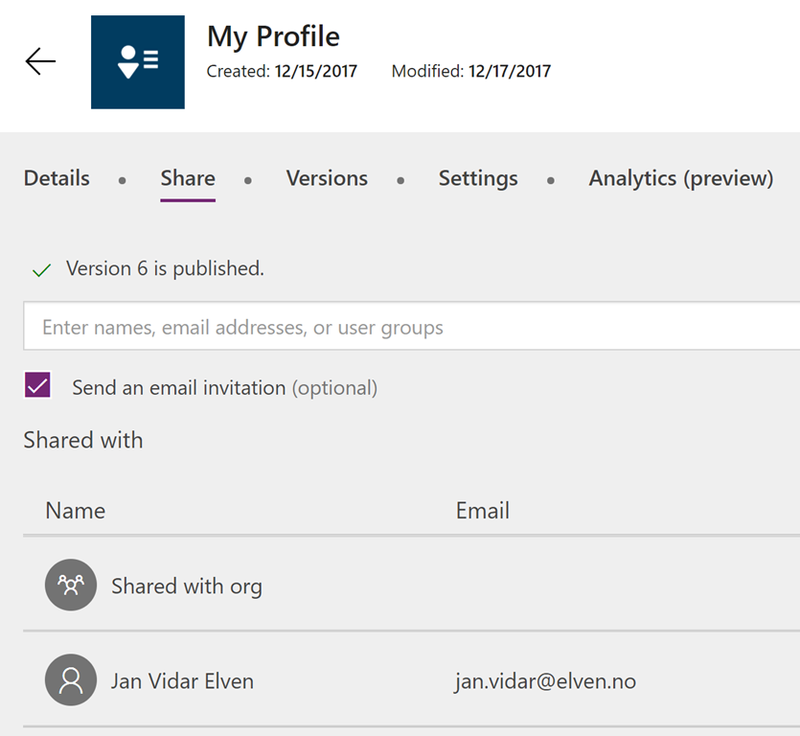 Using Microsoft Flow with your PowerApps will make it possible to add workflows with actions and condtions to your apps. 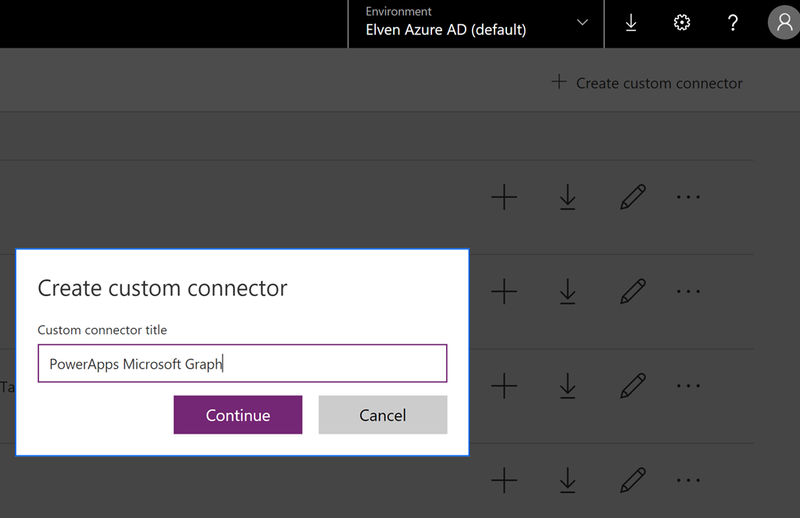 When creating a custom connector like we did to Microsoft Graph earlier, the same connector is available for your Flows. 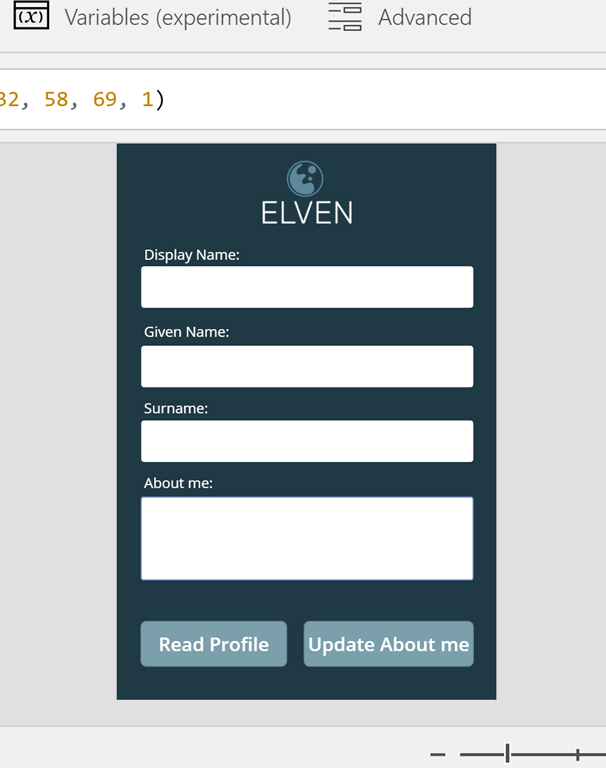 This will create an input I later can use from PowerApps. This is all I need to do now, but I could have added more actions for example for sending an e-mail after updating the profile etc. 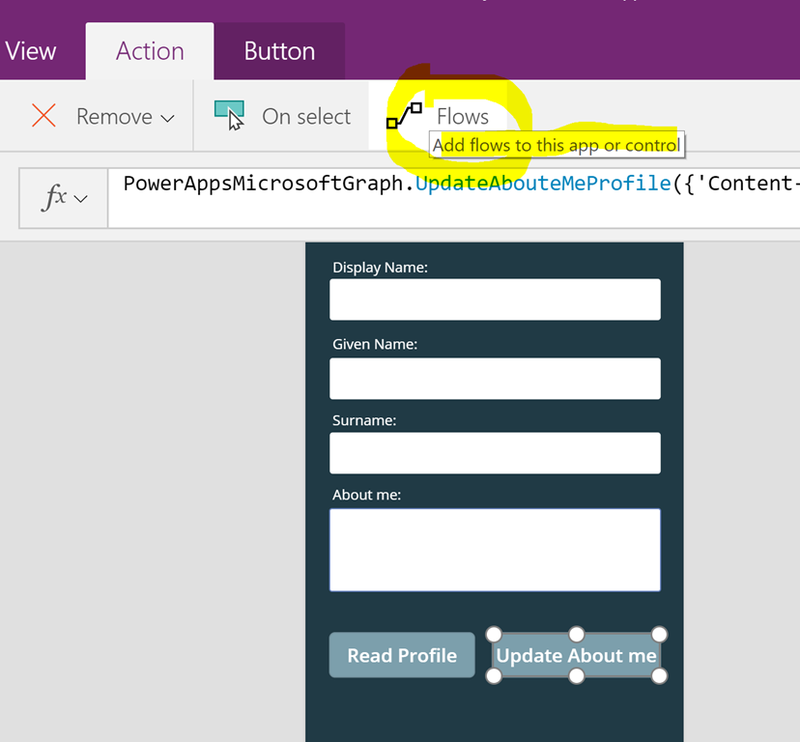 Using a Flow will not only handle some types of inputs and outputs better for custom connectors than directly from PowerApps, but also make it possible to create more logic to your apps using workflows with actions, conditions and a lot of other data sources. 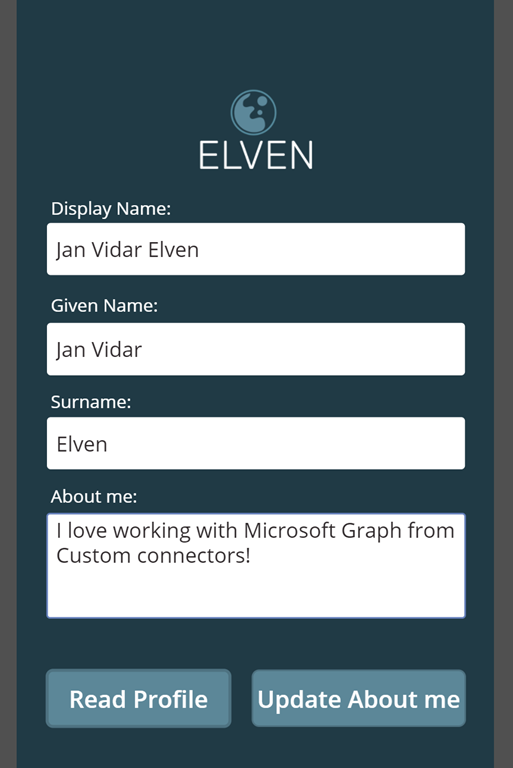 Sharing an app that uses a custom connector, like we use for the Microsoft Graph, it will be automatically shared, but users must create their own connections to it. 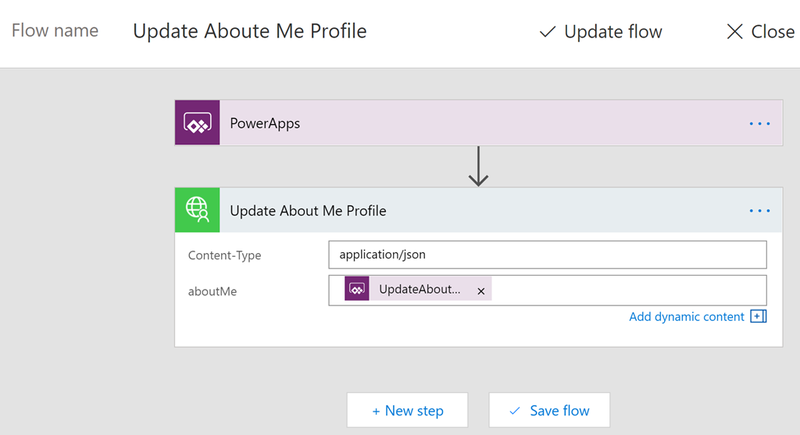 And when sharing an app that includes a Flow, users who run the app will be prompted to confirm or update any connections on which the flow relies. In addition, only the person who created the flow can customize its parameters. 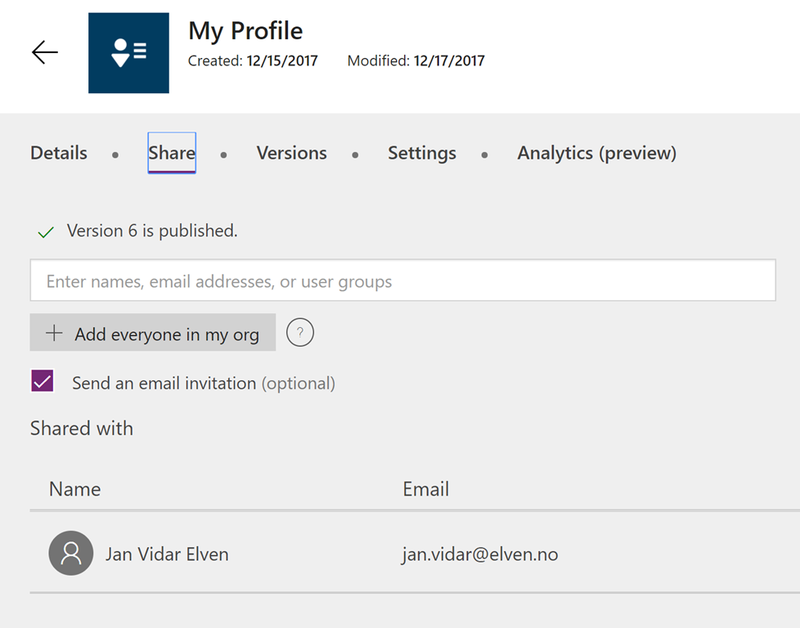 You can share the PowerApp to specific individuals, to groups or to the whole organization. 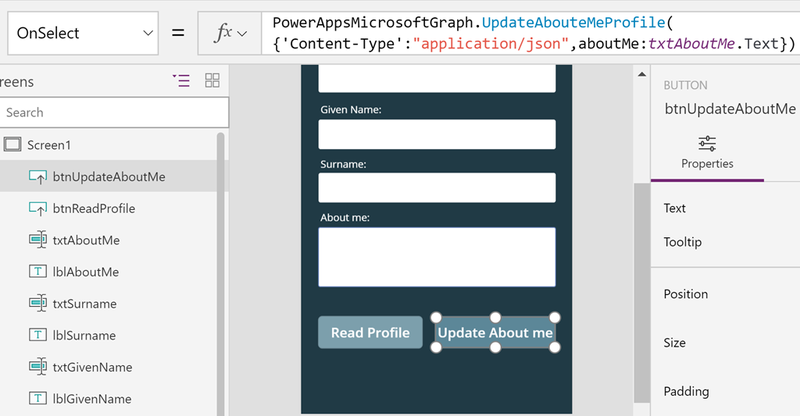 In this blog post we have seen how we can access the Microsoft Graph via a Custom connector in PowerApps and Flows. 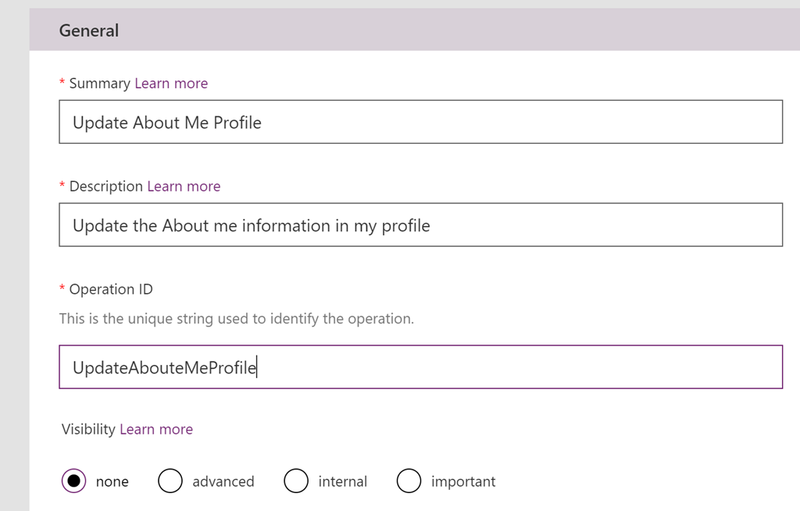 The sample shown in this post is simple with working with the profile of the logged on user, but with the power of the Microsoft Graph this opens up a lot of possibilities! 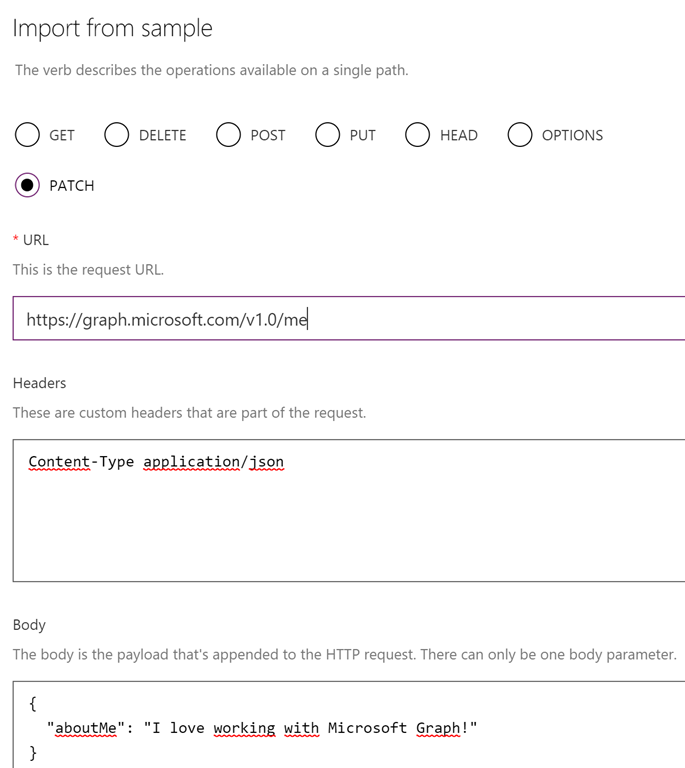 In later blog posts I will show some more exciting scenarios for using the Microsoft Graph, and I will link back to this blog post as a reference for how to get it all set up! Thanks for reading, let me know in the omments if you have any questions or maybe some ideas for usage scenarios! 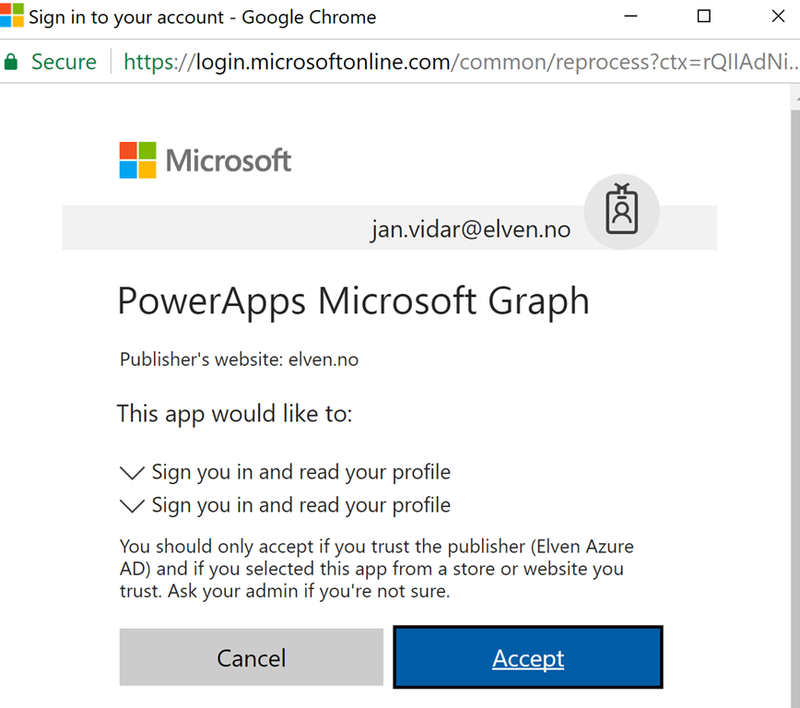 This entry was posted in Azure AD, Microsoft Flow, Microsoft Graph, PowerApps and tagged Azure AD, Microsoft Flow, Microsoft Graph, Office 365, PowerApps on December 17, 2017 by Jan Vidar Elven. Images in the blog post you mean? Yes, they should be visible, just verified. Great post. I worked through the example without any problems. Thanks for your feedback and sharing, glad it was useful!